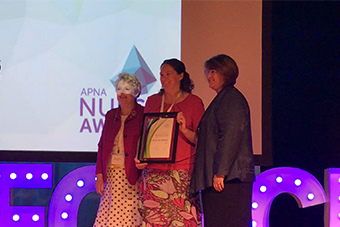 A finalist being a finalist in the APNA Recently Graduated Nurse of the Year 2018. 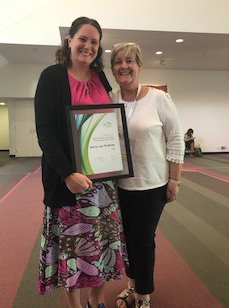 Sydney North Health Network would like to congratulate Kerry Lee McBride on being a finalist in the APNA Recently Graduated Nurse of the Year 2018. The award is given to a nurse who has excelled and shown leadership and excellence in the field of primary health care; inspires other nurses and healthcare professionals; provides a voice on behalf of other nurses in the community; contributes to improving health care outcomes in patients; puts back into healthcare by inspiring others. Kerry successfully completed SNPHN’s new graduate transition program in 2017 and since completing the program has continued to be employed in primary health. Congratulations Kerry, we wish you continued success!